Catching Up with Stampin’ Up! Wow! We have made it through two weeks of school here. Things are finally starting to calm down and get back into a ‘normal’ routine. Part of my new normal is remember to post to my blog. I had great plans for regular posting and weekly (or more often) updates. Alas, that is an area for which I still need to make significant improvement. I am happy to report that I have made some improvement in the arena of photographing my samples for the blog. The weekend before school started I spent a great afternoon with my upline and other team members. I have gotten some awesome ideas for some upcoming classes. There are some cute items and ideas coming out in the Holiday Catalog that goes live on September 1. Now, on to the cards we made at card class on August 11. This was the “Last Days of Summer” Card Class. Remember, card class is the second Thursday of the month. 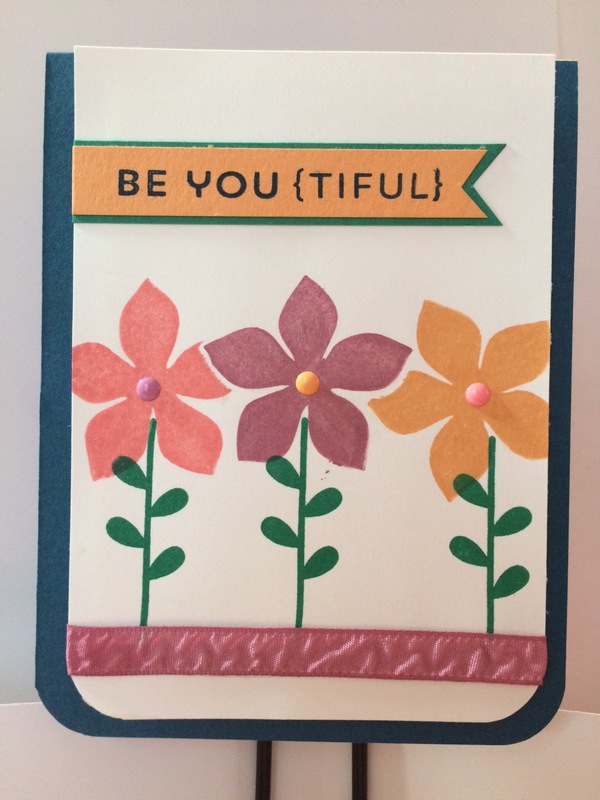 The next Girls Night Out Card Class is September 8. The cost is $15 for six cute cards (or free with a minimum purchase). I will list the colors and the stamp sets used for the following cards. You can shop 24/7 from my website. This card is made with Dapper Denim, Sweet Sugarplum, Peeakboo Peach, Flirty Flamingo, and Emerald Envy inks. Papers are Dapper Denim and Whisper White. The ribbon is Sweet Sugarplum.. If you noticed that these were the five 2016-2018 In Colors, you get a prize. The stamp set used was Flower Patch Photopolymer. This is a VERY versatile set of stamps with multiple flowers and great sentiments. Members of the Card Class learned how to use regular post-it notes as a mask to allow layering of the stamps, providing depth of the overall image. This stamp set comes with the matching Flower Fair Framelits dies which makes it super easy to cut these out for additional layering. Here is a photo that uses these stamps and dies for a true dimensional experience. The colors used for the images were Flirty Flamingo, Peekaboo Peach, Sweet Sugarplum, and Emerald Envy. The card is made of Dapper Denim with a Whisper White front. The pennant is from Peekaboo Peach and Emerald Envy Card Stock. It was all finished off with the In-Color Enamel Shapes and Sweet Sugarplum Ruched ribbon. Step 1 – Use the solid dots, stamp off on scrap paper to lighten the image. Stamp the solid dots on a piece of Whisper White that is approximately 5.25 inches tall and two inches wide. Step 2 – Use the open dots and stamp on top. This is a great way to add some color to your paper — but not too much. Step 3 – I finished off the card with the tag cut by hand (2/3) and trimmed to shape. Simply back the tag with the Designer Series Paper and add a ribbon. 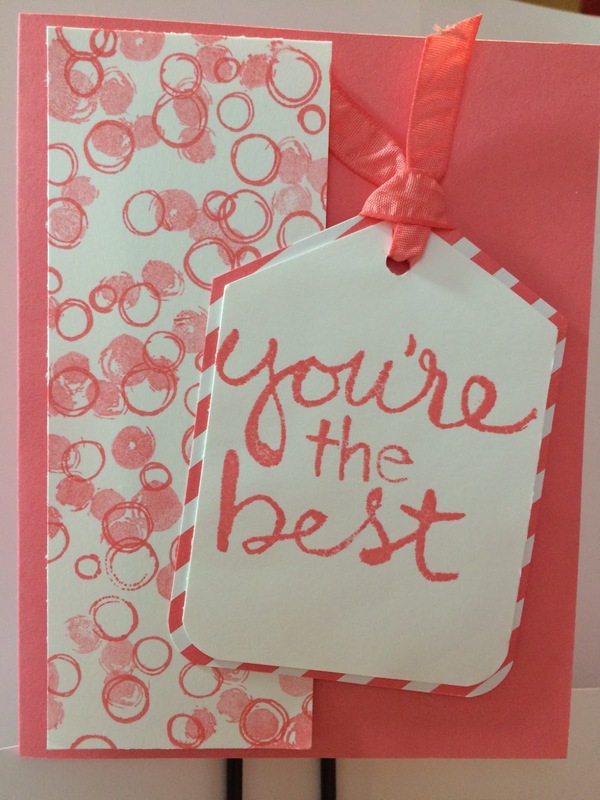 This basic card can be replicated any number of ways depending on the color combo and the sentiment you want to use. I worked to keep my cards for this class within the 2016-2018 In Colors…..in retrospect, I think this led to this card being too dark. However, onward and upward. I am ashamed to admit that I did not retain the name/link for the original posting of this card. It is incredibly simple but can be dressed up so much more than what is shown here. As you can tell it is a simple, A2 card (half of an 8.5″ x 11″) with a side fold. The actual card base is Whisper White Card Stock. After making the base, you will trim 3/4 inch from the front of the card. The card front is Dapper Denim cut at 5.5″ X 3.5″. This is the same as a quarter page cut, with 3/4 inch trimmed from the long edge. 1. Using a small motif, stamp in one or multiple colors on the ‘inside’ of the card along the long edge that will show when the card is closed. This sample used the Swirly Bird set for this part. When stamping along this edge, be sure to stamp off the edge some and stamp slightly to the inside of the card so the pattern continues to the inside of the card behind the card front. 2. Stamp your sentiment of choice using Dapper Denim on a piece of Whisper White Card Stock. This sentiment comes from the Thoughtful Branches stamp set (limited availability). At the same stamp the leaves from the ___ set using Emerald Envy ink on Emerald Envy Card Stock. 3. Using your Big Shot and the Flower Fair Framelits Dies, cut one of the flowers out of Whisper White being sure to include all of the sentiment. Also cut the two leaves from the Emerald Envy you stamped in the previous step. 4. Attach the piece of Dapper Denim to the card front. Tie a short length of Sweet Sugarplum Ruched Ribbon with a single knot. Attach that to the card using a glue dot, leaving the ends of the ribbon until you have built the remainder of the card. 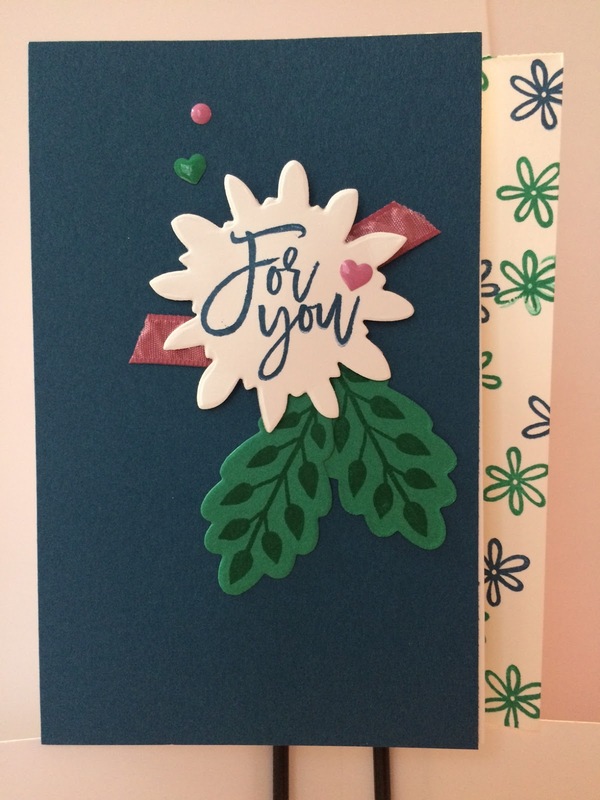 Using Stampin’ Dimensionals, attach the Whisper White flower on top of the ribbon, affixed to the card base. Then, tuck the two leaves up under the flower and attach with Snail Adhesive. 5. The final step is to embellish the card with the 2016-2018 In Color Enamel Shapes. Trim the ribbon ends. Next postCome Celebrate With Me!